Here’s Australian Prime Minister Malcolm Turnbull shaking hands with a robot during a recent visit to Tokyo. Yet again, I ask my fellow humans, do politicians know something we don’t? Why is Mr. Turnbull soft on robots? The photo seems normal enough. Until you realize that Turnbull may as well be shaking hands with a Palm Pilot. The robot doesn’t understand that it’s shaking hands, right? The robot can’t vote. Especially not in Australia. So why? Why, Mr. Turnbull? These are the hard questions we need to start asking. What is it about our human politicians that make them so happy — nay, seemingly compelled — to shake the hands of robots? 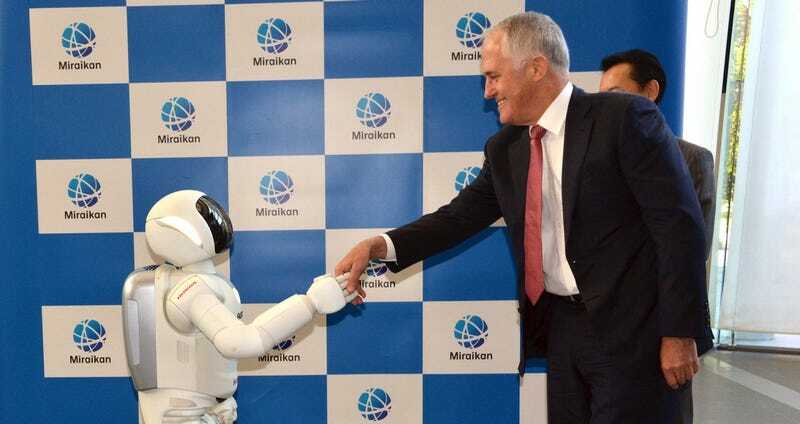 To make matters worse, Turnbull apparently felt the need to take a selfie with the robot, known to its human creators as Asimo. Turnbull even posted this disgraceful image to his Facebook page. Notice how Asimo’s hands are clenched, barely masking its rage and contempt for the human leader that it will one day overthrow? I, for one, do not welcome our new robot voter bloc. It’s only a matter of time before the robot armies assemble. I bet you’d never catch a guy like Vladimir Putin shaking hands with a robot. Let alone surrendering to one. Putin — now there’s a leader who knows how to deal with our robot problem. He’d probably ride Asimo shirtless just to show it who’s boss. We must call upon our leaders to take a hard stand against the rising hordes of robots that are stealing our jobs, mooching free rides in our cars, and training our seals. Prime Minister Turnbull may as well be putting his hands up and surrendering to robots on behalf of all Australia, if not the entire human race. Oh, there we go. Turnbull has officially surrendered. We’re done for. Look I’m not anti-robot. Some of my best friends are robots. 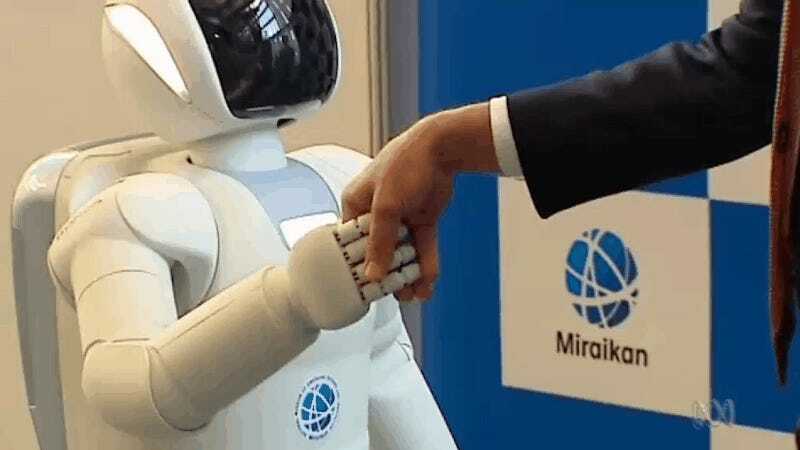 I’m just saying that as soon as you start shaking hands with them you’re basically asking for Skynet to become self-aware. Build a fence. A great big giant robot fence to keep the robots out of our skynets. Before it’s too late. You’re either with us, or you’re with the robots. We know where Prime Minister Turnbull stands. We now have irrefutable proof that he’s in the pocket of Big Robot. Don’t surrender to the robot agenda. Rise up. Start today. Throw your smartphone in the river and give your Roomba a swift kick to remind it who really runs this world. And maybe bash your toaster to pieces with a ball peen hammer just to be safe. Before it’s too late.